I’m pretty sure all Americans either say, “That’s what she said,” or hear the phrase about a googooplex times a day. I’ve found, however, that when people say “that’s what she said” it more often than not turns out that “she” didn’t say anything like that. 1. Can you repeat the question? 2. Hon, did you take all of your vitamins today? 3. Is your hearing aid on? 4. I think my gout is flaring up. 5. Oh my! It’s already 4:30 p.m.? We need to eat dinner. 6. Did you see Wheel of Fortune last night? 7. These fried apples are my favorite. 8. We should buy that rooster in the store for the kitchen table. 10. Let’s make sure we have fiber on our grocery list. 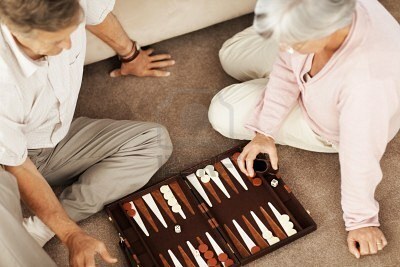 BONUS ANSWER: How about a rousing game of backgammon? I realized that after I took this survey that it was with the elderly population and was conducted at Cracker Barrel. Maybe I’ll try this again at Bob Evans to get more accurate answers. James Miller is author of Basie & Paisley Children's Books, including "A Spider Lives In My Belly Button," "A Monstrous Smile," and "A Moose In The Basement."